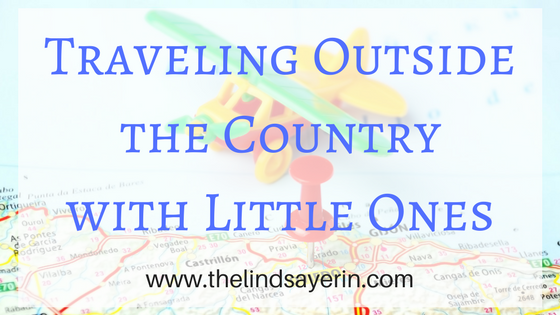 Call me crazy, but we are prepping for our first out of country experience with littles! CT has flown quite a bit since my parents live in NY, but Laurel hasn't flown at all. And neither of our children has ever been outside the country before. (Ages 3 and 7 months) So, this is a new experience for all of us and I thought it might be worth documenting the preparation leading up to the trip as well as any tips I can share after we return in the even that you might be traveling as well! 1. Get passports sooner rather than later. This ended up stressing us out for a few reasons. Did you know you have to have a scheduled appointment to do passport applications at the post office?! We walked in one day to find out and then the first available appointment was 3 weeks out. That was slightly nerve-racking because that 3 week window put us scarily close to the deadline in which we needed to apply in order to receive our passports on time. (They typically take 4-6 weeks). Luckily, my husband and I already had passports from traveling we did before children, but both kids needed passports + pictures and although we thought we had everything in order when we arrived, it still took closer to an hour to get it all done. Sidenote: you can't have too many copies of EVERYTHING so be over-prepared in that arena. 2. Check out the amenities at your resort. We are traveling to an all-inclusive resort with my business and we already know what is available for the kids so that we aren't over-packing. For instance, I know that there is a lazy river, kids pool area, and water slide on site meaning we will most likely spend the majority of our time at the pools rather than the beach. However, I'm planning to pack some inexpensive sand toys because the beaches look incredible there and shade is provided by tiki huts so although I plan to bring some extra shade for the baby, I'm hoping it won't be necessary. I've called ahead of time to reserve a crib for the room for the baby so that it should be in the room when we arrive and that is one less thing to worry about. 3. Schedule your flights accordingly. When I'm traveling by myself I typically go for cheapest and forego the additional cost of trip insurance. Not the case with kids. What if your child gets sick with the flu 2 days before you fly out? Guarantee you cancel your flight and without trip insurance, you'd lose everything. I know it's an expense, but children make everything slightly unpredictable which makes insurance a worthy investment. This also means I'm willing to pay a little bit more for airfare if it means a shorter layover or a layover in an airport I know has a children's play area inside. *This is a list of the most kid-friendly airports in America. Personally, I've been to Philly with a toddler and it was worth the trip on the tram to the play area to keep him occupied and let him run out his energy. The best advice for prepping a big trip with little ones is to know what you are walking into; take the time to plan ahead and brace yourself for the unexpected. Are you traveling anywhere in the near future?